In the early nineties I watched (and helped when I could) my Mom be a caregiver for her Mom, my grandmother. I saw firsthand what a tough job being a caregiver is… it’s hard. In my Mom’s case she spent over a year taking care of her Mom 24/7 before my grandmother passed away. A caregiver will spend countless hours tending to someone who may not make it. It really does take someone special to take on the job of a caregiver. I know I’m thankful to my Mom, and I now my grandmother was, even if she couldn’t express it. Sometimes a person is in an accident and incapacitated for a time and needs a caregiver to look after them. Do you know a caregiver whom you would like to sing their praises and thank them? 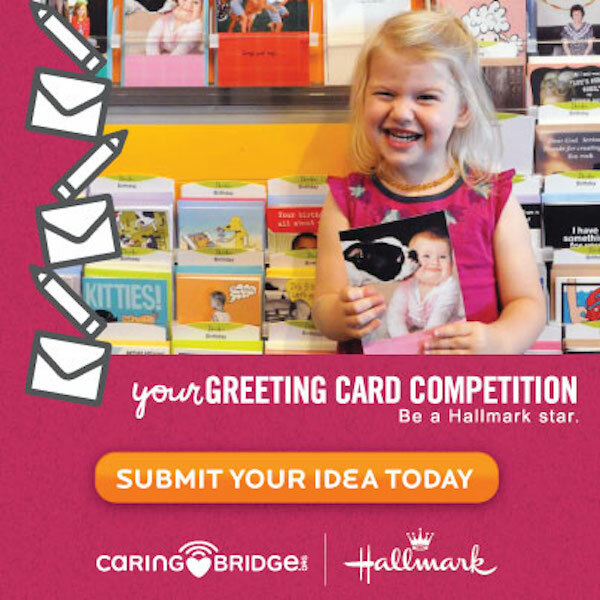 Well CaringBridge, the nonprofit caring social network, and Hallmark Cards are joining to make that possible by bringing you the “Caring Messages” card contest during National Family Caregiver month. Support and Encouragement – What can you say to lift someone up or help them get through the day? Let them know you’re thinking of them, send happy thoughts and cheer them on. Compliments and Appreciation – Let someone know how much you admire them: What they do and how they do it. Words from the Wise – If you’ve experienced something yourself you understand what it’s really like. Write a supportive message for others based on what you’ve learned or what you needed to hear. Be sure to submit your idea by or before November 17 to show your appreciation or if you are or have been a caregiver yourself, let others know they CAN do it with words of encouragement. I love showing people that I care about them and cards are an excellent way to do this. CaringBridge is such an amazing organization. This is a very thoughtful campaign. I know a couple of ladies in my family who have been caregivers — I agree it’s a difficult job.